It’s been quiet. Oh so quiet. But as usual there has been heaps going on behind the scenes. Vanessa did a superb job of the Auckland Fabric-a-brac on March 9th – I’d like to thank her and Mercy Hospice for taking the concept and running with it. If you belong to facebook you can see photos of the event here. Yes, yes, we have a taker. I can’t reveal all just yet, but we have enough people to make FBB in Wellie happen again! So put 27 April in your diary – Massey University’s amaaaaazing Great Hall is the venue. We are all super excited. Start spreading the word. And then just when you thought you had had enough exciting news – there’s more! We have an event planned for November this year for New Plymouth. 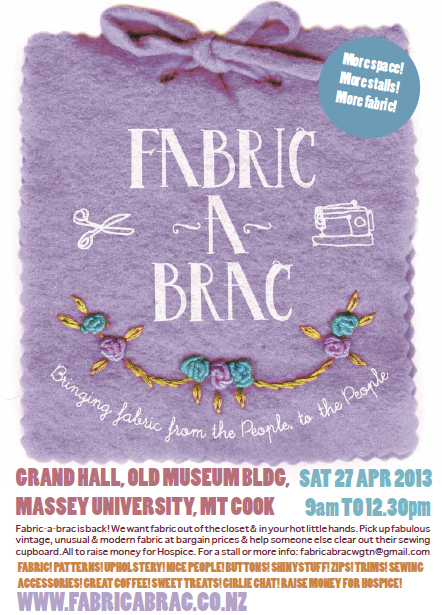 I think there’s going to be heaps of gems coming out of those sewing closets in the Naki – so put it in your diary. 2 November 2013, more details here. It’s going to be a great year – thanks for your support and looking forward to some amazing fabric delights!